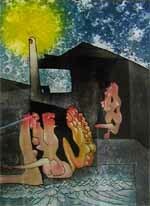 Roberto Sebastian Echaurren Matta was born in Santiago de Chile in 1911. Roberto Matta graduated as an architect in 1931 and worked in Le Corbusiers architect office in Paris 1935-37. During a trip to Spain in 1936 he became aquanted with work of Salvador Dali. 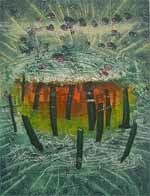 After this trip he turned to painting and has since than been devoted to surrealistic painting with a technique, which has inspired many well known artists. His work is exhibited in all major museums of modern art world-wide. 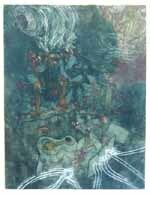 In the ArtNetGallery we exhibit som characteristic examples of this great artist works in lithography. Roberto Matta died in 2002.